The phone wakes me early on the morning of my departure. I’m heading for Malta, to join up with the MSF/MOAS team on the Phoenix, rescuing people attempting to cross the Mediterranean in leaky, un-seaworthy vessels. I think of the terror they must have felt as their boat filled with water, or capsized –I haven’t heard the full story yet. And I know that only desperation would have forced them onto that perilous journey across the deep waters of the Med. Desperation with their lives in Somalia, Eritrea, Syria, Afghanistan, Libya: war-torn, anarchic, little-hope places. I think back to my time working with MSF with Syrian refugees in Turkey, in 2012. Medically-trained Syrian refugees were staffing our clinic, and I remember the stories they told me. Of the bombs falling daily near their homes, of friends and family members killed, of there being no choice but to escape. Of exhausting, terrifying treks to the border, one with a pregnant wife and small child, all with no possessions but a small suitcase. “I don’t think I’ll ever be able to go back to my country,” I remember one consultant, a very qualified, highly educated man in his 50s, telling me. He and the others are just some of the 4 million people who have had to flee Syria to save their lives, most of whom will now have been living in overcrowded refugee camps in the countries bordering Syria for three years. Maybe some of them are now attempting to reach Europe in the hope of a better, safer life. I think back to my time in South Sudan where people, bombed in Blue Nile State in Sudan, had trekked through the bush for up to three months, living on berries, arriving in South Sudan so dehydrated and malnourished that dozens just died on the side of the road. It is with the plight of these refugees in mind, these people whose faces I remember so well, who I think of as I set off on this trip to help rescue yet more hundreds, thousands of people who, through no fault of their own, are forced to leave their countries. We have a humanitarian duty to help them. Not just in saving their lives in the Mediterranean, but in helping to provide a secure future for them. What right have we to lock ourselves safely up in we’re all right Jack mode in Fortress Britain? Grateful for people like her helping with this overwhelming crisis. Truth and knowledge diffused among the people are necessary for the reclamation and preservation of our Democracy, rights, freedom and liberties. Fellow Americans, our country’s moral responsibly is dead. The roots of these refugee crises are the wars in Iraq, Afghanistan, Syria, Libya and other countries. We know that the “roots” of the crises in these countries which have given rise to this “Human catastrophe” is the United States of American; George W. Bush created this exodus of innocent people that was force to leave their country and seek refuge in the EU. But the response to meet America’s moral responsibility of this crisis created by their greed for power and control of the Middle East oil is only a guilty silence. Any serious consideration of what lies behind the surge of refugees into Europe leads to the inescapable conclusion that it constitutes not only a tragedy but a crime. More precisely, it is the tragic byproduct of the US criminal policy of aggressive wars and regime change interventions pursued uninterruptedly by the US imperialism, with the aid and complicity of its Western European allies, over the course of nearly a quarter century. The US, the UK and NATO are responsible for the EU refugee’s crisis. The destruction and the killings by the wars in the Middle East is the root of this problem. We’ve lost sight of the simple fact that our fellow humans are in dire need of help, having fled death and destruction in their homelands only to face an even more perilous journey into Europe. 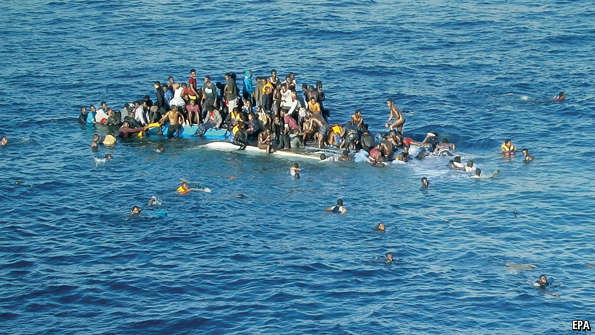 This refugee crisis was created by us; a huge number of people are continuing to cross the Mediterranean in voyages that have killed more than 2,000 so far this year. We must take responsibility and now is the time to help the people who need it the most. Enough is enough; our attitudes have to change we must see the human and not the imagined danger that anything is under threat apart from these people’s lives, somehow our government has stopped seeing refugees, but they are refugees created by their military actions and tried to deny them the assistance they are legally, and morally, entitled to, is the worst crime against humanity. But it has to end, and end now; it has to end because people are dying in their thousands, because Europe’s reputation as a champion of human rights is disintegrating, because if we don’t act now we will regret it for the rest of our history. U.S. Military intervention in Iraq. Blessings on you for your journey and giving hope to those who have so little left. Hi I’m a journalist and I’m keeping an eye on the refugee crisis. I’m now looking for a refugee who writes blog. Because I want the world to hear their true voices. Do you know any person? Thank you for your help! Thank you for going .. and blessings on all trying to help. I pray that the desperate many find safe waters. You are wonderful. Thank you for doing what you are doing.